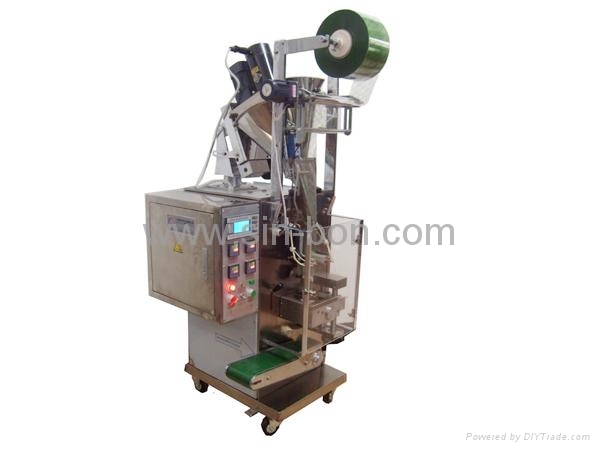 Vertical Packaging Machines are widely used in food, chemical, pharmaceutical and light industry, including powder packaging machine, granule packaging machine and liquid packaging machine to pack granule, powder, liquid, paste, tablets or pills into small bags. All packaging procedures including bag-making, measuring, filling, sealing, cutting and counting are finished automatically. LCD display, step motor slips bags, Either setting bag length or photoswitch tracing making bag can finish bag length and cut in one step, save time and film. All the parts touched material to be packed are made of stainless steel or non-poisoned materials. Well observing side-open shield cover is easy and safe to operate. Vertical packaging machine has small volume, low power consumption, driving system is simple and reliable and maintenance is easy. Specially designed position-stop function insures heat-sealer and cutter always in open position whenever machine stop to work, preventing packing film, material and sealers burning. Packing Material should be composite films such as PET/PE, PAPER/PE, PET/AL/PE, OPP/PE etc. Step motor is applied in bag-making system. Controller with Chinese or English displaying. With quadruple heat-control and reliable photoelectric detectable system. Print Batch No. and Manufacture date automatically and with tearing notch. The screw rotates driven by step motor to feed materials can obtain high measuring precision.